Pulau Pinang or Penang, the Pearl of the Orient, really needs no introduction. 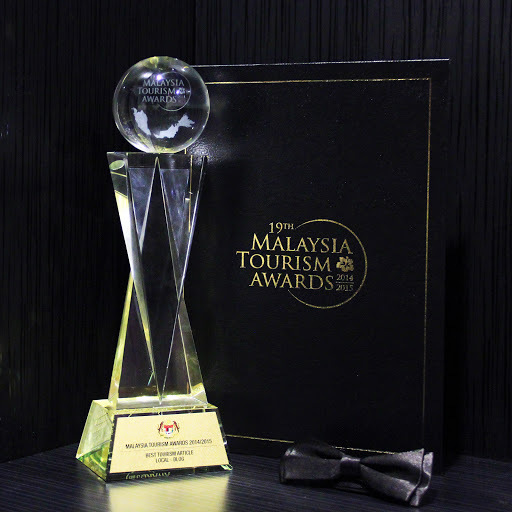 Its status as a UNESCO World Heritage site, interesting and unique street arts, and most importantly, its food offerings which made Lonely Planet to recognise Penang as the world's top culinary spot for 2014, have elevated Penang further as one of the main tourist destinations in Malaysia and the region. 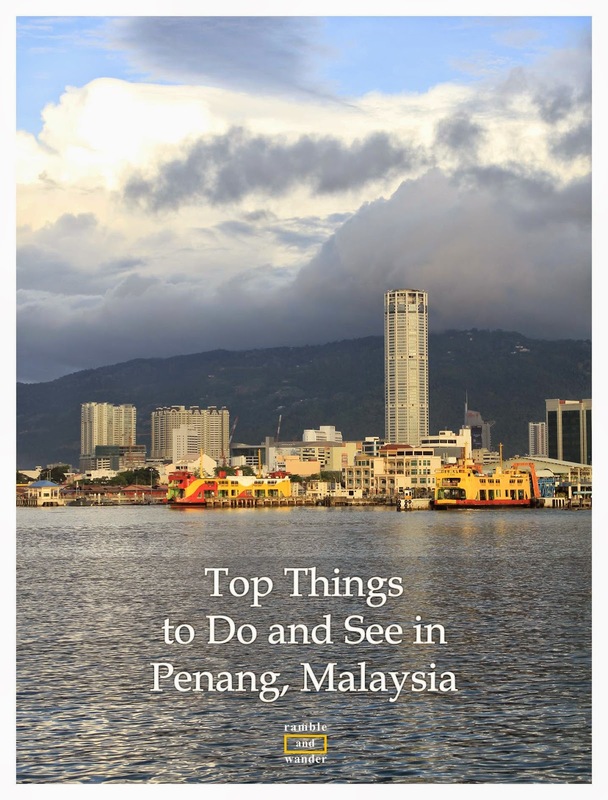 For this instalment of “Top Things to Do and See in…” with a local perspective, Ramble and Wander has invited Julia Mahir of Mummy to the Busy Bees, a Malaysian travel blogger who now calls Penang as her home, to share her list of things to do when visiting Penang. Breakfast like a king, they say. If you’re going to spend your day exploring the beautiful city of George Town or going on a picnic in the evening at Batu Ferringhi Beach, you might need a heavy breakfast to fuel up for the day. There’s a food court at Taman Tun Sardon, Gelugor that offers a variety of local food for breakfast. Here you can find all the delicious stuff, from the most popular serabai in Penang, to the finger-licking chapati with kuah daging and, if you fancy having rice for breakfast, nasi lemuni. Besides these, there are also other Malay kuihs, roti canai, sandwiches and of course, nasi lemak too. Chowrasta Market, which is located at Chowrasta Road facing Penang Road, is the jeruk buah (pickled fruits) heaven of the Pearl Island! You can find all kinds of pickled fruits - mango, cermai, kedondong, salak and nutmeg among others – here apart from dried and other local food. Trying, or even bagging, a packet or two of these is a must! After buying some jeruk buah for yourself, friends and family, you might want to continue going on a street food hunt around the area. Just take a stroll along Penang Road and you'll find a few cendol, rojak and chestnut stalls around Chowrasta Market. 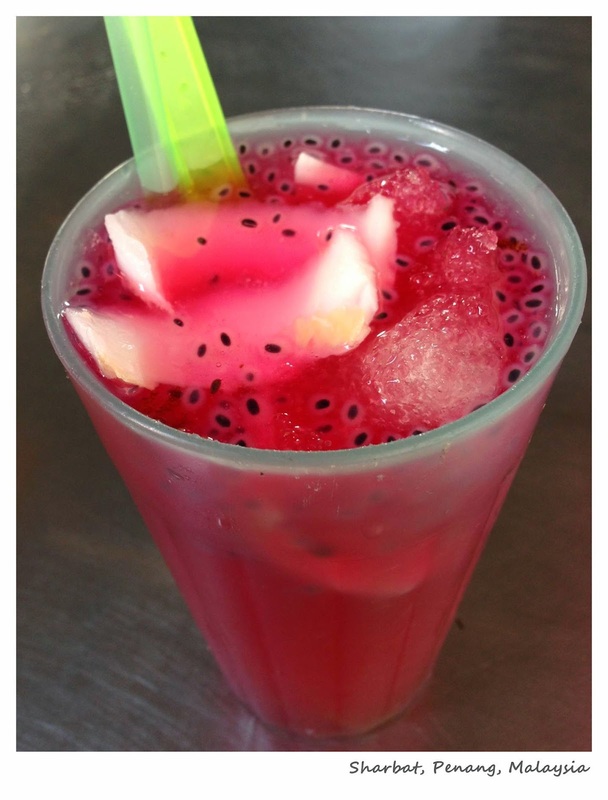 One of the must try drinks around the city is sharbat, also known as ais tingkap. Sharbat is a very refreshing drink that is prepared using coconut water, syrup and some other secret ingredients. It's a must on a hot sunny day and a perfect way to wash down those pickled fruits you have just had. When you think of Penang, of course one of the first things that comes to your mind might be nasi kandar. Nasi kandar, a local traditional Indian-Muslim food, is basically a meal of rice with dishes like curry. Tourists who come to Penang would most likely go to try Nasi Kandar Line Clear or Nasi Kandar Beratur, both of which have become popular after appearing in most local newspapers and online travel sites. One of the best nasi kandar that is famous among the locals however is Nasi Kandar Tajuddin Hussein. Located in Little India, Nasi Kandar Tajuddin Hussein is well known for its dishes like Ayam Ros and Kambing Cincang (minced lamb) and also for its South Indian soup, Rasam. P. Ramlee was a film actor, director, singer, songwriter, composer and producer back in late 1940s through to early 1970s. He won at least an award at 7 different Asian Film Festivals for his acting, musical score and films, making him an icon to the industry especially in Malaysia. Rumah Kelahiran P. Ramlee – the house where P. Ramlee was born – has been rebuilt using the wood from the original house which was demolished to give way to new government quarters. There are lots of P. Ramlee stuffs on exhibition, such as his birth certificate, school report cards, identity card, favourite clothes and violin, and a collection of his photos with lots of people, from fans to friends, to wives and Tunku Abdul Rahman, the first Prime Minister. What’s more fun to do in Malaysia than going to a pasar malam (night market)? Malaysia is famous for its pasar malam, which can be found almost everywhere. Penang also has its fair share of pasar malam, one of which is in Batu Ferringhi. This pasar malam starts every day at around 6.30 p.m. until around midnight. You can find almost everything you need for everyone in the family and more. From accessories to home decorations, and from t-shirts to toys. You can also find beautiful handicrafts and batik sarongs which you can buy as souvenirs. Just remember to bargain hard before you decide to buy and pay for anything (other than food). If you’re lucky, you could get them at half the price they were originally quoted at! Have you been to Penang? What did you like most about the place? What are your top things to do and see there? If you are going there, do check out these hotels in Penang. In conjunction with Visit Malaysia Year 2014, Ramble and Wander would be inviting fellow Malaysian travel blogger friends to share their knowledge and insider info, through a guest post, about places and things they would personally bring their guests to see, do and try in their local area. This is the fourth of such guest post. have you been try all the thing above yet? if not lets plan and we go together hehe, that curry look very nice,and penang well known as curry lover right hehe. No, I haven't. Only been to Chowrasta Market once before. Was more on the hunt for street arts the last time I was there. :) Jom! November? Punya la advanced planning, heh! I was in Penang for a couple of weeks last year and I loved it, but I wish I had these insider tips then. I didn't know about any of those markets and they sound awesome.Something for the next trip. 3 years in Penang and I only visited 2 places in the list..I guess more places to visit then.. I've only been to Batu Feringghi and sadly that was like eons ago. And lately I read quite a few blogs writing about Penang. Maybe I should visit Penang this year and do my own exploring.. Went there with my family about 8 years back and Penang was superb! The Indian street was well maintained and very clean. Enjoyed our visit there albeit short visit on our way back from Kedah. Never been to Malaysia, but we're planning to visit this year. Your blog is very helpful.. Thanks a lot..
Nice collection of things to do in penang, as a traveler i found really good information from your post. thanks for it. Great list of things to do in malaysia, as a traveler I found an really useful information here. thanks for sharing.